One of my favorite parts of “Living in Style Paris” was getting to see more of the work of legendary designer François Catroux. It was such a treat for me mostly because he doesn’t have a website with a portfolio for me to sate my visual cravings on a regular basis. I did come across this lovely home a while ago (can’t for the life of me remember where, so sorry there will be no credit unless someone out there can assist in that department)…and it quietly whispers Catroux style in abundance. From what I have seen of his work, Catroux uses neutrals like a master and makes a “beige” room seem warm, rich and inviting. These are no exception. He’s also a virtuoso at mixing modern and vintage. 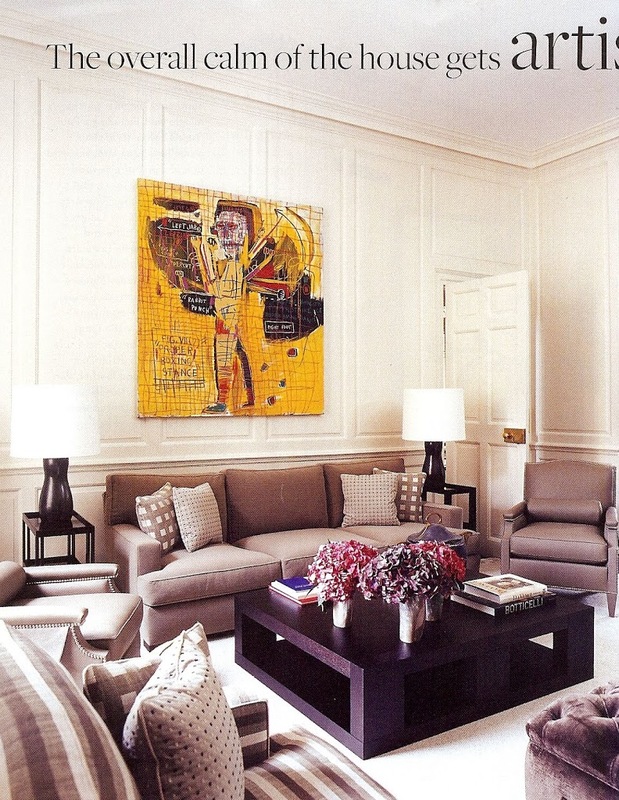 The work of one of my faves Hervé van der Straeton seems to be also a favorite of Monsieur Catroux and his clients as I noticed a few of his pieces in this apartment. …so what does everyone else think? A Hervé van der Straeten chandelier hangs in the entrace above an English Regency mirror and a c. 1917 Viennese ebony & silver bench. In the main living area antiques such as the Viennese ebony chair and a Regency mirror mix harmoniously with more contemporary pieces such as the Hervé van der Straeten designed lamp and cabinet, a Christian Liaigre side table, and custom pieces designed by Catroux. The Flowers painting above the fireplace is by US artist Donald Baechler. A Jean-Michel Basquiat painting provides some colour in the otherwise neutral library. 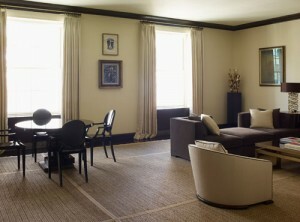 The custom sofa and chairs are by Catroux, the coffee table is from Christian Liaigre. T.H. 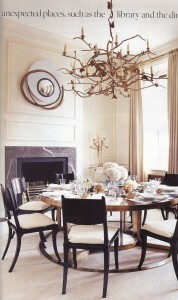 Robsjohn-Gibbings designed dining chairs by Saridis around a Catroux designed dining table. 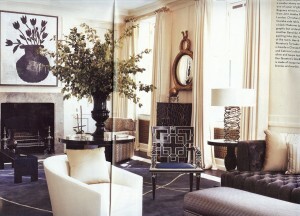 A custom Claude Lalanne chandelier hangs above and a Hervé van der Straeten mirror sits above the fireplace. 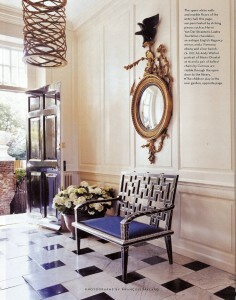 All photos from House & Garden November 2006, photography by Robert Wyatt.